What Is the Process After I Pay My Divorce Lawyer the Retainer Fee? Divorce can be a long, expensive road to travel, or it can be relatively quick and simple, depending on your ability to reach a settlement agreement with your spouse. The lawyer you choose will probably have a good idea which way your divorce is going to go after meeting with you for an initial consultation. Based on this, most divorce attorneys require a retainer fee. The fee is roughly equal to how much time he thinks he’s going to have to invest to get you divorced, barring unforeseen circumstances. When you pay your lawyer a retainer fee, he places the money in trust, a bank account set up to hold money that technically belongs to his clients. As he works toward getting you divorced, he will bill his time against your money. For example, when he drafts your divorce petition, it may take him an hour. He will write this time in a log when he’s completed the task. Periodically, usually at the end of the month, he’ll add up all the time he spent on your case. If he spent 10 hours working for you, and if his hourly rate is $250, he will move $2,500 of your retainer money into his business account. He's now earned it. Lawyers usually bill in either 15-minute or six-minute increments, rounding upward. If your lawyer bills in 15-minute increments and he spends one hour and five minutes drafting your petition, you retainer money will be charged for an hour and 15 minutes of his time. Unless your attorney is a solo practitioner, he will also use your retainer money for the time his paralegals or junior associates contribute to your case. 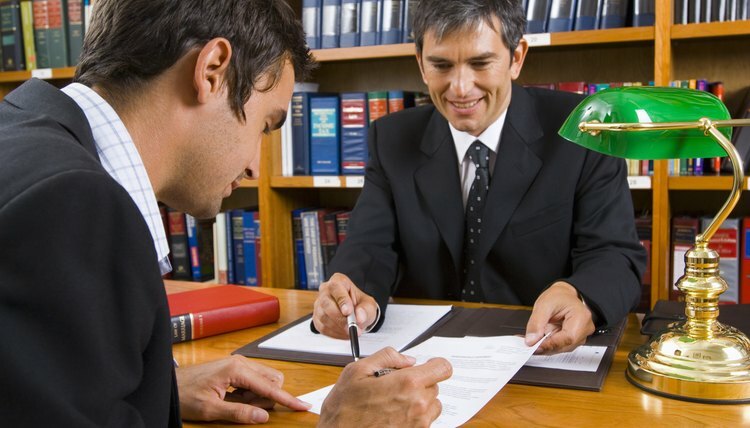 The hourly rate for a firm’s paralegal is usually less than half of the attorney’s rate. If your lawyer's paralegal drafts your divorce petition, and if his paralegal’s rate is $100 an hour, that's what you'll be charged, and not the attorney's higher rate. Most divorce lawyers do not charge against your retainer for secretarial or clerical time, but you'll probably be billed for phone calls with his paralegal, just as you would if you spoke with your attorney on the phone. Some attorneys will pay your court costs from your retainer money; others will expect you to pay these fees separately. There will be a fee for filing your divorce petition or an answer to your spouse’s petition. There will also be a fee if you have to file a motion to have the court decide issues such as support or custody while your divorce is pending. Depending on the complexity of your case, you might also have to pay someone to appraise assets or to perform a custody evaluation. However, attorneys will rarely pay these kinds of costs from your retainer. They’re generally expensive, and your lawyer doesn’t want to deplete your retainer money before he’s completed your case. At the end of each month, you should receive a bill from your attorney. This doesn’t necessarily mean that you owe him money. It shows you exactly what he used from your retainer money, including his time, his staff’s time and court costs. It tells you how much retainer money you have left in his trust account. When and if your retainer money is depleted, some lawyers will ask you to put down another lump sum to be deposited in trust and billed against. Others will just begin billing you on a monthly basis. Instead of a statement showing you how your money was spent, you’ll receive an invoice for money actually owed after your retainer money runs out. Can You Get Your Retainer Back if You Stop a Divorce? Minnesota Lawyers: How Much Will the Divorce Cost? A “simple will” means different things to different people. If you’re not a legal professional, you may think that if you don’t have much property to bequeath, writing a will should be simple. If you ask an attorney for a simple will, however, he will take it to mean that you want to leave everything to your spouse, and when your spouse dies, it passes on to your children. If you have neither a spouse nor children, you might want to leave all your assets to one individual. A simple will means that you’re not dividing your life’s possessions among a multitude of beneficiaries. It has nothing to do with the size of your estate. The cost of a contested divorce can escalate to tens of thousands of dollars, so it's no wonder many couples run into trouble financing the fight. Although a simple uncontested divorce might cost less than $1,000, contested divorces usually require many court appearances by your attorney and your attorney must spend hours preparing for these appearances. At an average hourly rate of $250, spouses can easily spend $2,500 just asking the court for temporary support orders early in the case. When you add in fees for experts, such as real estate appraisers and forensic accountants, the cost of a divorce can skyrocket.